Here, Okpewho takes the opportunity to drive in the point that he concentrated on in the previous work The Epic in Africa (1979), which is that the practices of oral literature are not solely related to religious ritual. He cites well known and respected anthropologist Ruth Finnegan, who has done quite a bit of work in Africa but, according to Okpewho, still gets it wrong. (And I gotta say, I’m starting to have some stray thoughts of possible misogyny in Okpewho’s work. How are there NO WOMEN in this whole book, despite the fact that Harold Scheub’s extremely influential work concentrates HUGELY on women storytellers in South Africa…? Here we have the ONE female scholar cited, and she is swiftly dismissed. Just saying…it’s something to think about…) Anyway, this beginning put a bit of a bad taste in my mouth, because he seems here to be setting Finnegan up as a kind of straw (wo)man. In fact, these words he seems to feed her are not even her words. The statement she makes, which Okpewho finds so objectionable, is actually someone else’s, with whom Finnegan is only tentatively disagreeing. This chapter is incredibly useful if you want a quick “state of the discipline and how it got there” refresher on the various scholarly trends that were picked up by those who analyze myth – not necessarily African myth, but myth in general. I have a feeling that this is, literally, the “Oral Literature 101” survey course he was probably teaching at the University of Ibadan. He very usefully goes through several schools of thought, but also organizes them based on categories for which he provides an illustration at the back of the book. Evolutionism : This is the generation that was inspired by Darwin’s The Origin of the Species and brought James Frazer’s The Golden Bough. Okpewho notes three different trends – solarism (it’s all about worshiping the sun), euphemerism (men die and become gods) and naturalism (every myth issue from nature) – but what these all have in common are: 1) an interest in origins, 2) a perception of the “rude science” of folklore, 3) importance of the personification of fictive concepts, 4) a moral. Jung (who, by the way, according to Okpewho, wass a notable racist – in my opinion, was a racist but probably a fairly unnotable one…) concentrates on the unconscious as collective and interprets symbols in dreams and the unconscious as tracing back to certain archetypes – universal forms that come from mythology and act within our minds in the same way throughout time and space. Diffusionism : So while evolutionists believed that men and their myths developed identically, independently, diffusionists used a comparative approach to show that historical contact between people was the factor that makes these myths the same across the board. This movement brought the concept of the culture area (16) and also gave us the categories of type and motif through which myths could be read and compared to each other. Functionalism : This begins a new generation of scholars of oral literature, and we’ll see that, in everything that follows, the discipline starts to concentrate much more on forms rather than on ideas. This is the fun stuff, I think, but you have to get through a lot of charts for it to be fun. So this is Bronislaw Malinowski’s jam, and he’s gonna say something that’s gonna sound really familiar, which is that the definition of a function is “’the part which [anthropological facts] play within the integral system of culture’ and ‘the manner in which they are related to each other with the system’” (21). Yes, I KNOW that is Saussurian linguistics, y’all. The criticism Okpewho wields of this system, which is otherwise pretty good, is that Malinowski tends to take a static view of the nature of culture. The system is what it is, basically. “Though we may understand a traditional society largely from the ways in which its pristine outlook has survived, that survival my however be the result of adjustment to new circumstances which have imposed certain modifications on the old outlook” (22). Meaning, people who don’t write are not frozen in time. And seriously, can I tack that statement on someone’s door? For Okpewho, essentially, the functionalists have done a good job, but they’re not doing literary work. Symbolism : Ernst Cassirer is key here (yes, Cassirer of the Davos debate with Heidegger where they duked it out over Kant…sounds like a…blast…?) For him, myth comes from feeling, sense, and the physical world. So this, Okpewho equates with Freud’s focus on symbol in dreams coming from the (I’m assuming) specifically sexual sensation. This is tautegorical. But this isn’t where Cassirer’s thought will stay, because he also contends that myth mirrors the social structures of life (28), which Okpewho sees as leaning toward a more Jungian perspective: “What myth does then, then, is to isolate r abstract the images of this pattered social structure into symbols which reflect not so much the empirical components of the original reality as the archetypal qualities of human experience” (28). This movment in Cassirer’s Language and Myth is a movement from the functional to the structural-functional, from Freud to Jung, and from the tautegorical to the allegorical. This promotes a compromise between the time-bound and the timeless. Also, keep in mind, we’re still with the spirit of Saussure here, even more so with L-S. So for him, myths work like languages – “it is made up of constituent unites which derive their meanings only in relation to one another” (39). He coins the term mythemes. However, for L-S, myth will also different from language in that he sees it as translatable across contexts, whereas, of course, you can’t (quite) translate a poem into another language accurately, though you may have both languages at your disposal. L-S also wants myth to have a mediating function, and contends that myth is meant to serve a culture grappling with some contradiction present in worldview. So the main character will go between the natural and supernatural worlds, for example. He also mediates atom/structure in arguing that myth is a self-contained unit, but always in relation to others. 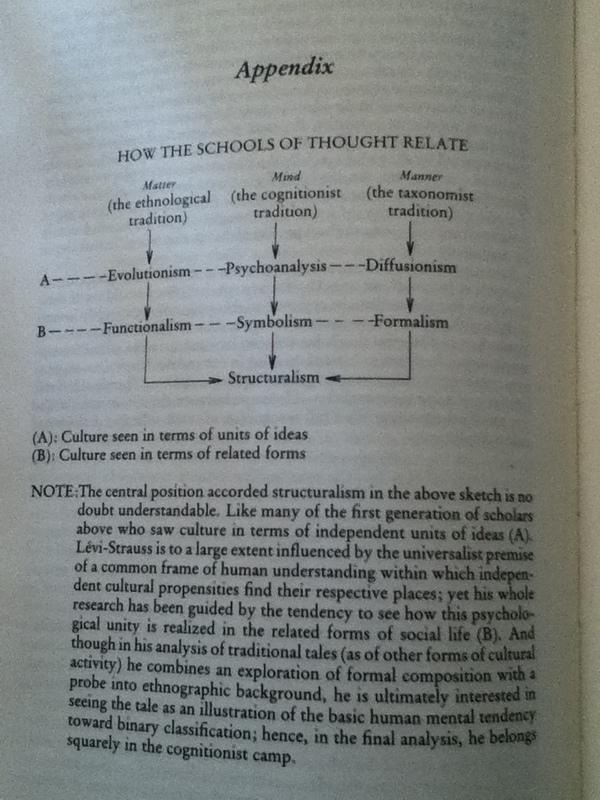 “Clearly, there are many weaknesses in the structuralist programme, and it can hardly be said to have provided our answers to all problems related to human nature or culture. None the less, by uniting a concern fr the vivid details of life (ethnography) with an interest in the abstract structure of activity (taxonomy) in its search for the basis of human behavior (cognition), it has provided by far the most challenging approach to an understanding of the most fundamental issues in cultural scholarship (44). “An old theory, and one that has enjoyed considerable vogue, holds that myths are oral narratives which explain the essences and sequences of ritual performances, thereby preserving the memory of these elements for posterity as such, myths are second to rituals in terms of evolution” (45). What we have here (as we had in the epic book) is a chicken and egg question. Which can first, the myth or the ritual. Everyone says it’s the ritual, Okpewho says it’s the myth. 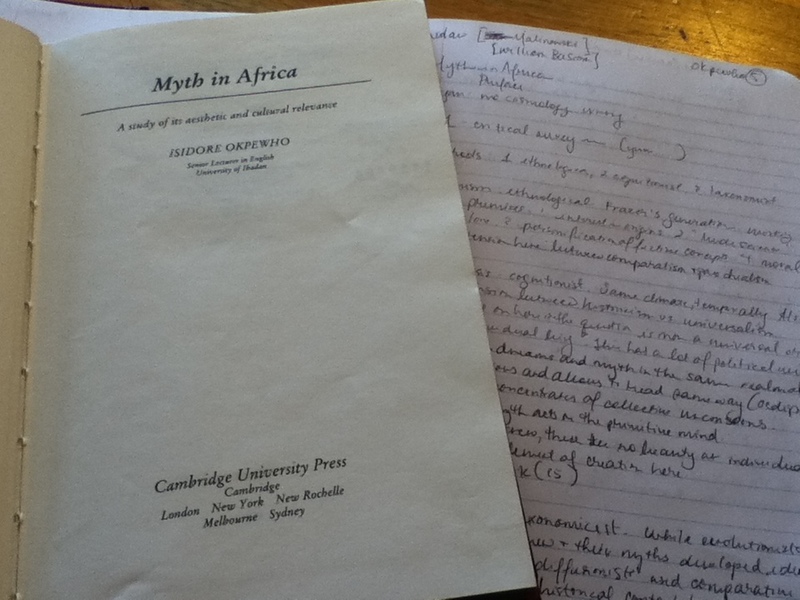 And while I painstakingly read this section, I don’t think I can go back and recount it, so it’ll suffice to say that Okpewho here does a major Goldilocks on the way myth is defined in the oral narrative studies he’s just gone through. 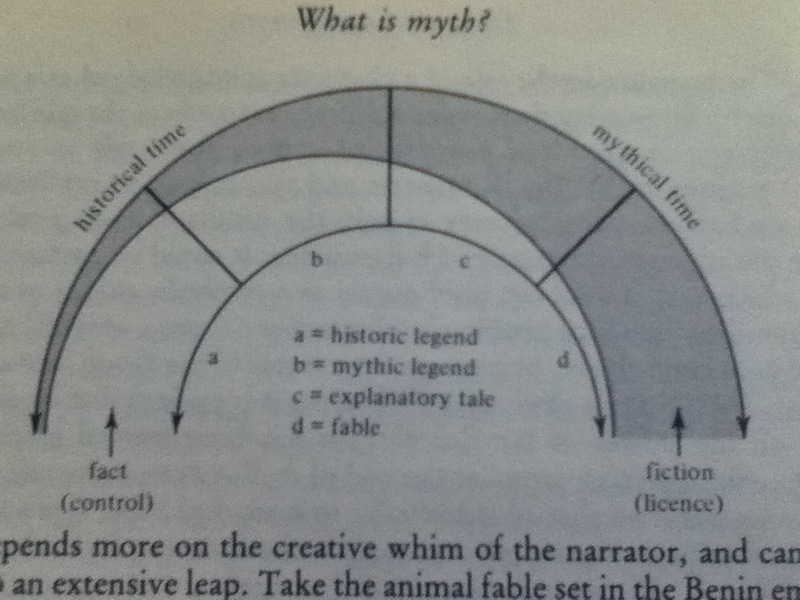 Essentially our question here is why myth is not a legend or a fable or a tale or what have you? He comes up with a qualitative approach that is a) very interesting and b) includes – you guessed it – a chart! “We have to qualify every tale – whether in prose or verse, whatever the distinction means; whether in a sacred or secular environment; in whatever manner of belief it is held in its indigenous setting – on the basis of our own scientific recognition of the relative weights of fact and fiction in it” (59). Now, badassedly enough, this qualitative approach is largely based on temporal assumptions. The way he is classifying oral texts largely has to do with what time they occur in, and the coolest thing for me here is that, the way it’s set up, if you go far enough back in time, you reach timelessness. But this timelessness can be any time – past, present or future. Tangent aside, he states that “Time, therefore, would appear to be a principle factor in the overall character of the text” (61). This gives fable an interesting position, and explanatory tales, to some extent, for these can function in an absolutely timeless way. They are not past or present. They don’t rely on any temporal markers. So for Okpewho, they are, in a sense, the most fictive and most mythic. Essentially, “the closer a tale gets to historical reality, the less capable it is of being an illustration or vehicle of larger, timeless, abstract ideas. The potential may persist but is certainly not prominent. But the other end of our arc is occupied by tales whose intellectual content is much stronger than in tales with a time-bound scheme; the explanatory tale, which rationalizes age-old customs, morality, and natural phenomena and the fable, which employs the power/play of symbol and mimesis to probe those large philosophical questions that have continued to exercise the mind of man since the undetermined origins of organized society. If such a scheme is accepted, then clearly, the more ‘poetic’ a tale is, the stronger is its content of intellectual play and thus its availability for exploring larger cultural or existential (as against experiential) issues” (69). This is a BIG DEAL, because this overturns every perception ever of the ‘primitivity’ of fables and explanatory tales. In fact, these are what constitute the most poetic and most intellectual bases of oral literature. Which doesn’t mean that the Epic of Sunjata is small potatoes, or even that it is not rife with intellectual considerations. But this overturns a kind of hierarchical thinking with which we generally preference the grand sweeping epics over the anthropomorphizing animal tales. But this leaves us with the same question – what the heck is myth??? “Myth is not really a particular type of tale against another; it is neither the spoken counterpart of an antecedent ritual, nor is it a tale determined exclusively by a binary scheme of abstract ideas or a sequential order of elements. It is simply that quality of fancy which informs the creative or configurative powers of the human mind in varying degrees of intensity. In that sense we are free to call any narrative of the oral tradition a myth, so long as it gives due emphasis to fanciful play” (69). “Myth, then, is the irreducible aesthetic substratum in all varieties of human cultural endeavor, from one generation to another” (70). There’s just one last thing I want to mention, which is that this section is called “The Meaning of Myth”…and in the concluding paragraph, Okpewho argues that many scholars have been able to intelligently analyzed the ends of myths, but have neglected to examine the means of myth, which are literary. Since his argument largely revolves around oral literature as an aesthetically important body of work – which is not separate from its cultural importance – it would seem here that the meaning of myth is, indeed, its means.